HTC is presently getting rid of unnecessary apps that Google already offers. As you can see in HTC 10, it didn't come pre-installed with HTC's official apps like Polaris office, Scribble, Fun Fit and HTC Internet. The phone also didn't come pre-installed with Gallery as it's been replaced with Google Photos app. If you use older versions / models of HTC phones or you have previously downloaded HTC Internet browser on your HTC 10 device, the browser will stop working and will be officially discontinued coming November 30, 2016. After this said date, the browser will be officially been removed and will no longer be available for download on the Google Playstore. But you can still export your existing Bookmarks from HTC Internet browser to another browser. 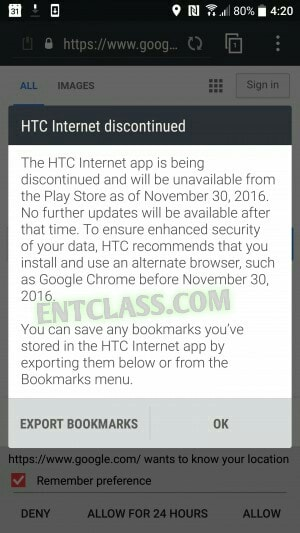 HTC also advised all to download Google Chrome browser before November 30, 2016. Do you use HTC Internet browser? If no, what browser do you use on your HTC device? I love the HTC Internet app so much I sideloaded it to my non HTC phone. It's the only one with proper text reflow and it's simple and fast. I don't like Chrome but what other alternatives are there? What don't you like about Chrome? Chrome browser is the best browser for browsing. Maybe you should try them out for once. I'm sure you'd like it.